The Israeli Information Center on Human Rights in the Occupied Territories, B’Tselem, issued a press release Monday stating that a second Palestinian was executed in Hebron on March 24th, in addition to Abdul-Fattah Sharif. Sharif’s case made international headlines because video of his execution, while he was lying wounded on the ground, was captured by a local resident and B’Tselem volunteer. The video was released publicly by B’Tselem, which led to charges being filed against the Israeli soldier who fired the fatal shot. The release of the video also led to harassment, interrogation and death threats against the Palestinian who filmed it. Now, two more Palestinian residents of the neighborhood have come forward with their own video footage and testimony that the second Palestinian killed by Israeli troops in Hebron on March 24th, Ramzi al-Qasrawi, was also executed. On 24 March 2016, ‘Abd al-Fatah a-Sharif and Ramzi al-Qasrawi were killed by soldiers’ gunfire in the Tel Rumeida neighborhood in Hebron. They were shot after they stabbed a soldier who, according to media reports, sustained light injuries. 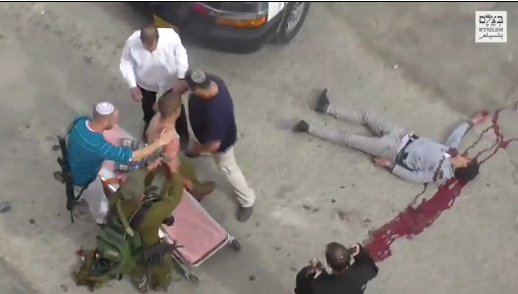 The incident was widely covered by the media thanks to video footage shot by B’Tselem volunteer ‘Imad Abu Shamsiyeh, in which a soldier can be seen executing the injured a-Sharif, shooting him in the head. The shooter, Elor Azaria, is currently on trial for manslaughter for his actions. The two stated that, on the day of the incident, they began following events after they heard gunshots from the street. They said that after both a-Sharif and al-Qasrawi were lying injured on the road, clearly posing no danger to anyone, and even before additional troops and the paramedics arrived on the scene, a soldier (or officer) went up to al-Qasrawi and shot him twice in the neck or head from several meters away. Later on in this incident, both saw Azaria shooting a-Sharif in the head, an action that was captured on ‘Imad Abu Shamsiyeh’s camera. The two eyewitnesses, both B’Tselem volunteers, documented parts of the incident with their cameras, but not the moment al-Qasrawi was shot. They both circulated the footage on social media immediately after the incident, and Nur Abu ‘Eishah was even interviewed shortly thereafter in the Palestinian press. Given how long it’s been since the incident and the gravity of the allegations, B’Tselem made clear to Nur Abu ‘Eishah and Amani Abu ‘Eishah that the military probably had footage of the entire incident on it security cameras located in the area, and that this footage could corroborate or disprove their accounts. Both witnesses repeated their testimony and said they were prepared to testify before any official body if summoned. Since the most recent wave of violence began in October 2015, a good number of instances were caught on video showing executions of Palestinians who stabbed or were suspected of stabbing Israeli security personnel or civilians. (For more on this subject see B’Tselem’s report of December 2015). In other cases, executions were alleged, but since there was no video footage, B’Tselem was unable to confirm the allegations. Many of these cases were captured on the military’s security cameras which are permanently installed in various locations throughout the West Bank, such as checkpoints or downtown Hebron. B’Tselem has no access to this footage, but it is available to the military, which for the most part takes pains not to make it public. This material is also available to the military’s investigating authorities, which as a rule choose to ignore it. There have been many reports since October of a policy permitting shoot-to-kill in incidents in which Palestinians harmed, or attempted to harm, Israeli security personnel or civilians, even when there is no clear and immediate mortal danger or if the danger can be overcome without resorting to a lethal outcome. Nevertheless, to date, these cases are hardly ever investigated, and no civilian or member of the security forces has faced charged for implementing his policy. The case of Sgt. Azaria, whose trial is still underway, is the one exception. But what is far more grave is that this open-fire policy has the full backing of senior civil and military officials. Israeli law enforcement authorities, both military and civilian, prefer not to deal with these cases, instead, shutting their eyes to this reality, thereby granting it legitimacy and enabling it to carry on.